It's time once again, the 5th Annual Family History Expo, February 27-28, 2009. The event will be held at the Dixie Center, 1835 Convention Center Drive, St. George, Utah, 84790. For complete details, visit the Family History Expos web site. . I don't know about fast cars or fast trains, but I do know genealogists prefer fast databases. Last night, I released an update to the core Live Roots search that improves performance significantly. Searches that used to take 40 seconds are now returning in less than 10! Also, you may have noticed that the Team Roots program is now available on LiveRoots.com (as well as GenealogyToday.com) via the new top menu options. While presently members enjoy only a few perks on LiveRoots.com, in the near future there will be some very interesting features just for members. Stay tuned! Live Roots was mentioned on the Genealogy etc. blog. I had the pleasure of attending a very informative talk by Megan Smolenyak at the Secaucus Public Library, hosted by the Hudson County Genealogical Society. Genetealogy is a term that Megan coined for the growing offshoot of genealogy focusing on how genetics can supplement traditional genealogical research. 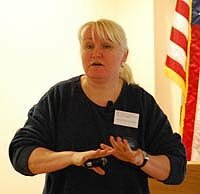 I've sat through other genetic genealogy talks and read dozens of articles, so I had a general understanding of the topic. Megan's talk, however, was wonderful as she reviewed each of the genetic testing options and how they relate to genealogy. She highlighted many misconceptions about DNA & genealogy, and suggested ways to counter them when persuading those stubborn relatives who haven't opened their mouths for you to swab. Many genealogists are driven to research to find deeper connections to their ancestors. What better way than through the DNA running throughout our bodies! One quote from Megan really caught my attention. She said we are all "living representatives of our ancestors," which is a great way of looking at this. All men carry the same Y-Chromosome as their male ancestors, and women share common MtDNA with their female ancestors. What I love about Megan's talks is that she keeps them very current. Her active role in the industry allows her to share trends she has observed and make predictions as to where this all may lead. She relates which projects are just launching, and which have been around (and thus have a larger DNA sampling databases). While I had a Y-33 test done of myself back at the end of 2007, there haven't been any exact matches yet, but a quick check on DNA.Ancestry.com is showing more close matches have appeared since my last visit. Megan shared with the group the websites that have DNA searches, so I really should take my haplotype data and check for matches in those other projects. My quick visit to DNA.Ancestry.com also revealed they have refined their haplogroup predictions. When I got the results in 2007 they said it was J2. Now they are saying its J2a1h, also known as the "Cultivators". If you hear about an upcoming Megan speaking event in your area, make sure you attend. If you don't have that luxury, you can always purchase her Trace Your Roots with DNA book and perhaps learns some new tricks for breaking down those brick walls. Thanks go to the Hudson County Genealogical Society for hosting this excellent genealogy session. If you have roots in Hudson County, New Jersey, be sure to join this group. They publish a quarterly newsletter that includes a schedule of upcoming meetings. Through a series of examples, in her article, "Turning Michigan-Canadian Research Upside Down," Judy Rosella Edwards illustrates her thesis that "Immigrants did not always follow a straight and obvious route. Michigan-Canada migrations create an intriguing panorama of people on the move. Browsing through biographies from the 1800s it becomes obvious that arrivals from the Old World traipsed back and forth between the United States and Canada." The article also shows how an understanding of the early geography can direct or redirect research. The "Images of America" series is a collection of books covering a wide range of topics in American history, including local area histories that may be relevant to your own genealogical research. Gena Philiber-Orgtega, in her article, "Using the 'Images of America' Series for Your Family History," explores the wide range subjects found in these books, their limitations, and how to make them useful. Wow! I didn't realize how many unique books, maps and cd-roms were produced by Heritage Books. They are all loaded into the Live Roots catalog and geocoded. I'm working with some additional publishers to obtain copies of their catalogs for inclusion on Live Roots as well. I've been getting some good feedback regarding the way results are sorted and will be making some changes within the next week. There's also a significant amount of name data for the Live Roots index in the queue, which should be online shortly. Ancestry.ca, Canada's leading online family history web site, announced in a recent press release, the online launch of the fully indexed Canadian Civil Servants Lists, 1872-1900, which features more than 78,000 records of those employed in departments of the Canadian Government during the country's early days of Confederation. Before online databases existed, there were physical record books kept of employment at government offices. Like the Victorian equivalent of today's corporate intranet or internet site, these record books would have been used to find out who did what, when and where. The records give family history researchers a unique opportunity to find out how an ancestor's career might have progressed and how much they earned, as well as offer personal individual information such as birth date, age, date of first appointment, years at post, promotion to present rank, creed or religion and nationality of origin. The records are available fully indexed and fully searchable online for the first time and help paint a more vivid picture of the working life of Canadians just before the turn of the 20th Century. They also provide a fascinating comparison of how the salaries and job titles differed from today.